One of the things that we love most about wedding and engagement photography, whether we are doing it in Hannover, Germany, or the Washington, DC, metro area, is helping the couples who hire us preserve memories of their love on film forever. That is the reason we started photographing weddings and engagements for a living, and it is what keeps us excited about picking up our cameras to take pictures. A bonus for us about capturing images of fiancés and newlyweds professionally, however, is the opportunity to express ourselves creatively. To take what we see and turn it into something completely new and different is a beautiful thing that is nourishment to our souls. And the best part is that using wedding and engagement photography as a creative outlet also benefits our brides and grooms, because the pictures we deliver to them show the love that brings them to the altar that much more spectacularly when we push the boundaries of what is possible with our cameras. This particular image is a great example of what happens when our mission to create photographs that tell our brides’ and grooms’ love stories is enhanced in beautiful ways by our using photographic techniques to create art. Though the picture appears to have been taken at night, we actually used our knowledge and skill as photographers to capture it in the early afternoon on a winter day in Hannover. We took this image while taking this future bride and groom on a photo tour of the city. We stopped at the Apostelkirche, a towering church in the eastern part of Hannover, after having already taken portraits of the lovely fiancés in the nearby Lister Meile, a famous shopping promenade running from the Hauptbahnhof (central train station) to Podbielskistraße, the main artery to the northeast part of town. We were about to head to Hannover’s Neues Rathaus (New City Hall), but we were fascinated by the Apostelkirche’s beautiful Neo-Gothic architecture and unorthodox shape. It looked like an ideal place to pose the future spouses for some epic couples portraits. The best spot in which to take pictures of them turned out to be the church’s front door. The arched doorway framed them perfectly as we took wider angle shots of them with the Apostelkirche soaring above them. It was also ideal for doing some more creative photography using an off-camera flash. Though tall, the doorway was not very deep, so we were able to illuminate it with artificial lighting quite easily. 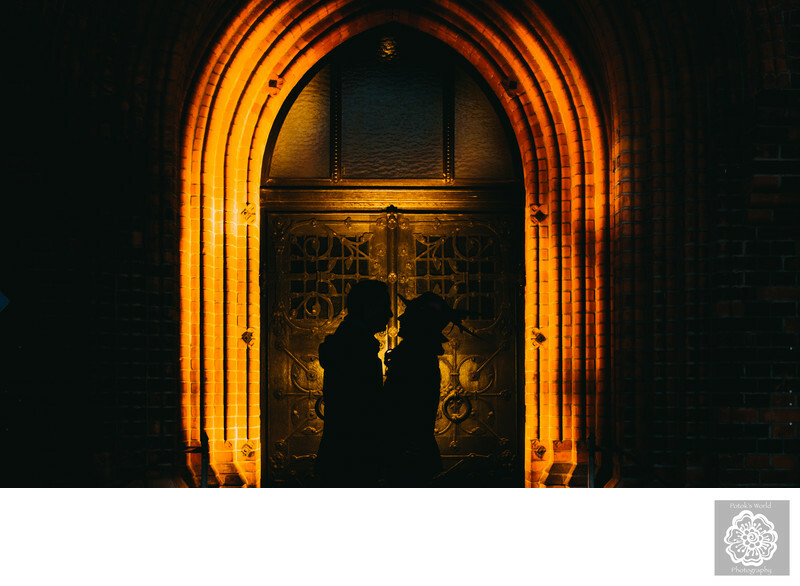 We put the lights behind the couple, added an orange gel to ensure that the color of the lighting would complement the red-orange of the bricks around the couple and set our camera settings to a very dark exposure so that the bride- and groom-to-be would be silhouetted against the illuminated doorway. The results, as you can see here, were fantastic. The colors are beautiful, and we love that the silhouettes are crisp enough that you can see the future groom leaning in to kiss his beloved, and the future bride smiling in anticipation. We also love the hat that she is wearing, which adds an interesting dimension to the outline of the couple. Location: Apostelkirche, An der Apostelkirche, 30161 Hannover, Germany.